Jesse Owens' Legacy: Hitler's Oak Tree Grows In Cleveland U.S. track star Jesse Owens made history at the 1936 Berlin Olympics 75 years ago, when he destroyed the Nazi myth of Aryan supremacy. He brought home four gold medals, and four oak saplings. The whereabouts of those trees has been a mystery. U.S. track star Jesse Owens made history at the 1936 Berlin Olympics 75 years ago, when he destroyed Adolf Hitler's myth of Aryan supremacy by winning four gold medals. But his feat also set in motion a decades-old mystery, about a unique gift Owens and other Olympic champions received from Hitler. In 1936, the German Olympic Committee gave athletes an oak sapling for each gold medal they won. The U.S. team received 24 such saplings; Owens came home with four of them. One of Owens' trees towers over Rhodes High School in Cleveland, where he trained. There is no plaque marking it, but track coach Tyrone Owens says it has long been a source of pride. "Several track coaches have sent champions down to the state meet over the last 70, 80 years," he says. "And we always have taken pictures when the kid places down state, underneath this tree." Coach Owens is a distant relative of Jesse Owens, and he says it's a happy coincidence that he's spent 31 years here as a teacher and a coach. While alumni come and pick acorns, and occasional visitors drive to see the huge oak, Tyrone Owens says that not everyone cares. "To the regular student body, it's just a tree. Just a tree," he says. "We try to push it through athletics. It's a very important piece of history that sits here in Cleveland, Ohio." While this tree is a part of history, what happened to Owens' other oaks is probably better thought of as legend. Some say one died. The University of Southern California had an oak in honor of the 4x100 meter relay team, on which Owens won his fourth medal. Two Trees With Roots In Berlin? Researchers are trying to determine if an English oak at Ohio State University (top) is one of the trees Jesse Owens brought home from the Berlin Olympics. 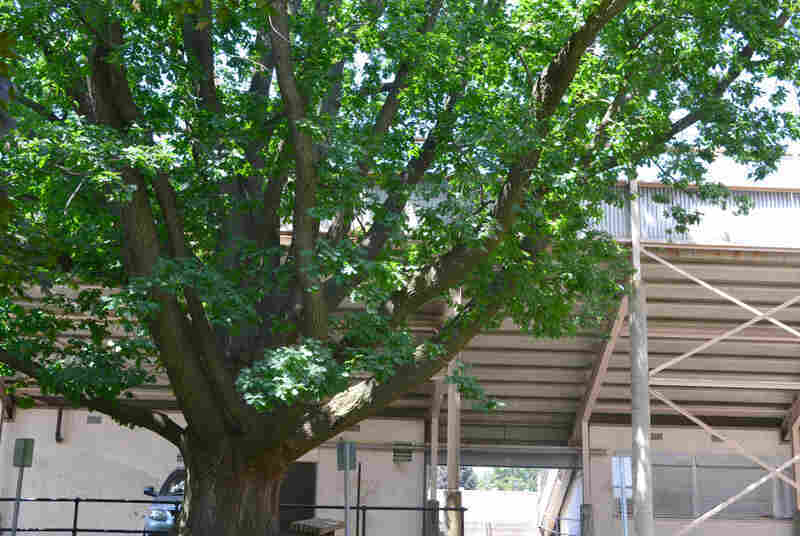 For years, the lone remaining tree was believed to be at Owens' high school in Cleveland (below). Another tree was said to be planted at the Cleveland home of Jesse Owens' mother, but it fell when the house came down in the 1960s. And in the film Jesse Owens Returns to Berlin, Owens himself explains that there's one more. "And one stands among the cherished mementos on All-American Row at Ohio State University, where I spent my college days," he says in the film. But there is no oak at Ohio State's All-American Row on the Columbus campus, and the school has no record of Owens ever planting a tree there. Jim Constandt, who wrote a book about the trees, says that only four of the U.S. team's 24 Olympic trees are thought to be alive. 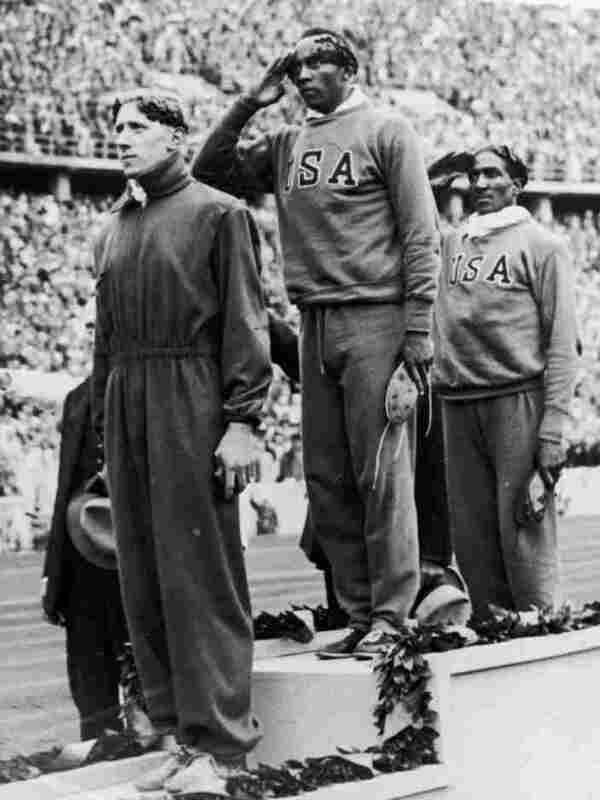 Some died; some athletes threw them away or hid them because of their association with Hitler. Few records were kept and, Constandt says, there may well be undocumented Olympic trees out there. "Well, the basketball team," Constandt says, "they cut cards to see who's going to plant it. Somebody planted it, but where they planted it no one knows. And the same with Jesse Owens' trees. I think nobody knows for sure the status of the four trees." 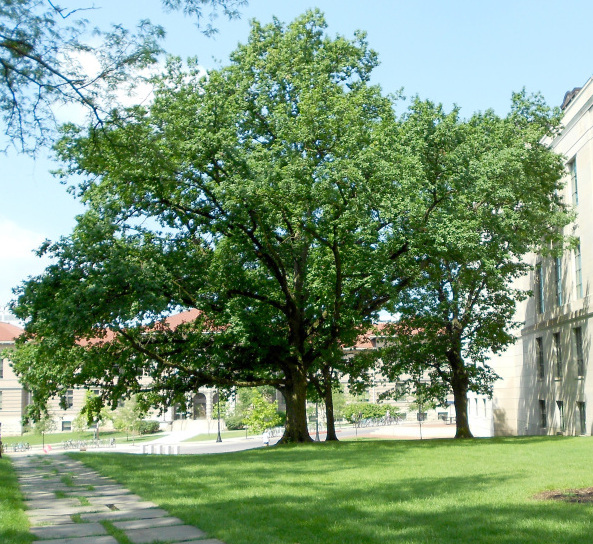 An English oak near Ohio State's library has long been rumored to be the lost Owens tree. And arborists determined it is the same species, age and size as the famous oak in Cleveland. The university wants to prove the tree's identity by comparing its DNA with other Olympic trees. OSU forestry professor Davis Sydnor says he's banking on the theory that the original seedlings all came from one, or maybe two, parent trees. "If they are that closely related," Sydnor says, "then DNA testing can come pretty close to saying it's from this group of trees. You know, that this one is found." Sydnor has cloned the Owens tree in Cleveland. He hopes to clone the Ohio State tree, too, if its link to Jesse Owens and the Berlin Olympics can be proven.